As a parent of a child with food allergies, I understand how frightening Halloween can be, and not in a good scare kind of way. Fortunately, you can be prepared enough to have only good scares on Halloween with some helpful tips from the American Academy of Pediatrics. Always read the ingredients on any treat your child receives. Many candies your children will receive contain some of the most common allergens. Be aware that even products they have tolerated in the past may not be safe due to different manufacturing of “fun size” candies. Often times a label will state, “manufactured in a facility that processes peanuts, tree nuts, milk, soy, etc”. If no label is available, plan an exchange of treats with friends, or your child can swap their candies for a prize from the “Treat Fairy”. If your child will be going to a Halloween party, remind them to politely turn down home-baked items and teach them never to share another child’s food. A must would be to inform teachers or other adults who will be with your child about the allergy as well, so they are prepared to act in case of an emergency. Your child should always carry their epinephrine autoinjector, and if not old enough to know how to administer on his or her own, the supervising adult should know this important piece of information, as well as be reminded of the signs and symptoms of a severe allergic reaction, such as shortness of breath, difficulty swallowing, hoarseness, swelling of lips or tongue. If a severe allergic reaction is noted, never hesitate, even if in doubt, to administer a child’s epinephrine right away and even if symptoms improve, your child should still be taken to the nearest emergency room. If you will be hosting a Halloween party, consider those with food allergies and offer non-edible treats or plan alternatives to trick-or-treating such as pumpkin decorating, scavenger hunts, crafts, Halloween themed games, etc. Also, be encouraged, as you are not alone, to let families know you are a food allergy friendly home and will be offering food-free fun for treats this Halloween. How? 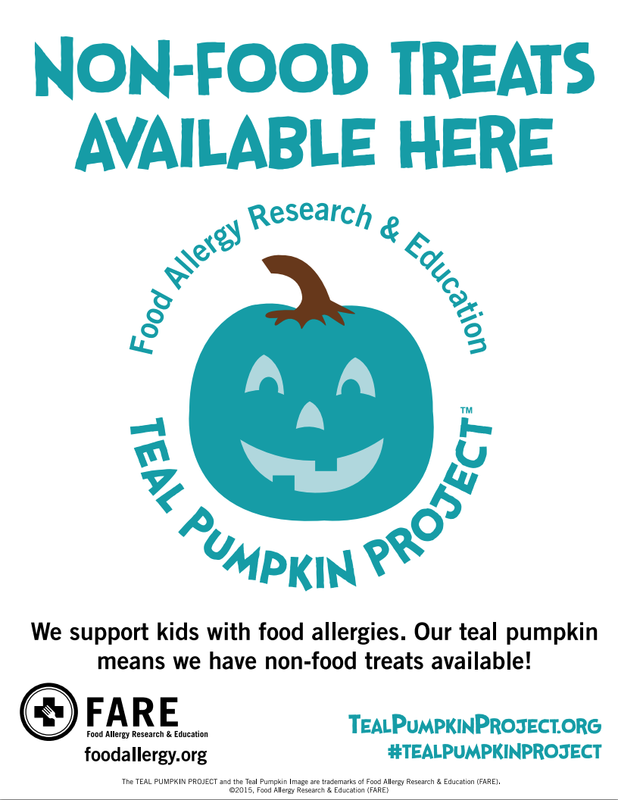 By participating in the Food Allergy Research & Education’s Teal Pumpkin Project. This means if you see a teal painted pumpkin outside someone’s home, they will be offering non-edible treats for your child. With a little preparation, there are plenty of ways to have a safe and fun Halloween without the scare of ending up in the emergency room. So, from our family at Pediatric Center of Round Rock to yours, have a happy and safe Halloween. Dr. Crystal Salinas is a Board Certified Pediatrician for the Pediatric Center of Round Rock. Her career interests include nutrition and obesity awareness, asthma, and newborn care. She also continues to serve as a continuity preceptor for residents at Dell Children’s Medical Center and enjoys medical missions. We love it here but my son is quite short for his age and when expressed concern about it, the Nurse Practitioner did not seem to be concerned and stated "he is on his normal growth curve". I would still have liked her to acknowledge that he is short and provide options on what could be done at this time.